When a simple "Danger!" "Caution!" or "Beware!" doesn't work at all, some witty people out there spare no effort to capture your attention with funny and creative warning signs. Whether they're stating the obvious or prohibiting something unusual, these signs are designed to make you watch out. We at Bright Side put together 16 pictures of hilarious and bizarre warning signs found by ordinary people. 16. Don't mess with guys from Idaho. 14. Human nature at its finest! 13. We all need this sign at work. 11. Beware of the cat. 10. "The Italian hotel we stayed in had these warning signs next to the windows." 9. We look so yummy! 8. You won't get out of here alive anyway! 7. Is this what the fox said? 6. 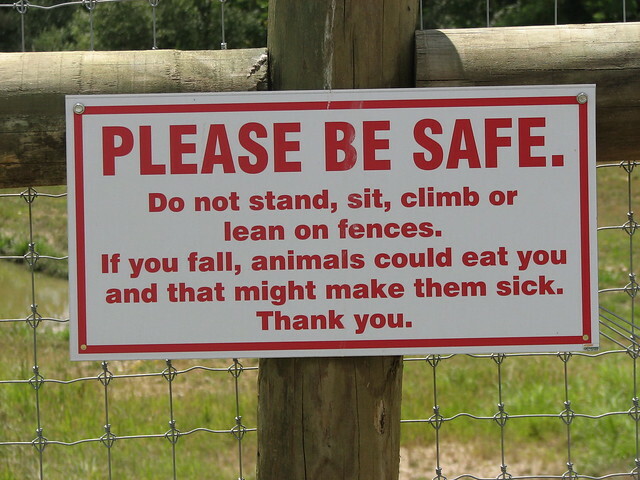 And we don't want the animals to get sick, do we? 5. Thanks for caring about me. 3. One does not simply use his brain! If you've got a picture of any similar warning sign, please share it with us in the comments!